SINGAPORE - When the Orchard station on the Thomson-East Coast Line (TEL) opens in 2021, commuters will be able to enjoy a seamless transfer between the North-South Line (NSL) and TEL platforms, thanks to a passageway running beneath Orchard Boulevard. The Land Transport Authority (LTA) has revealed how this is being constructed without disrupting the heavy traffic along Orchard Boulevard or commuters using the existing Orchard station. A method called pipe-roofing, previously used for the construction of a station on the Downtown Line, was employed. It involves creating an underground canopy of interlocked steel pipes, each with a diameter of 1.2m, around the tunnel. This allows mining to be carried out without compromising the road or buildings above, according to the LTA's Mr Henry Foo, deputy group director for the Thomson-East Coast and Cross Island lines. Micro tunnel boring machines were deployed to tunnel through the ground to install the pipes. These are about eight times smaller than the regular ones used for MRT tunnelling. The use of interlocking pipes also prevented misalignment and breakage of the pipes. Prior to the construction of the canopy, work was done to stabilise the ground and prevent water from leaking into the tunnel. Steel frame supports were installed later on. Mining within this set-up was completed last December and a permanent concrete tunnel is currently being built. 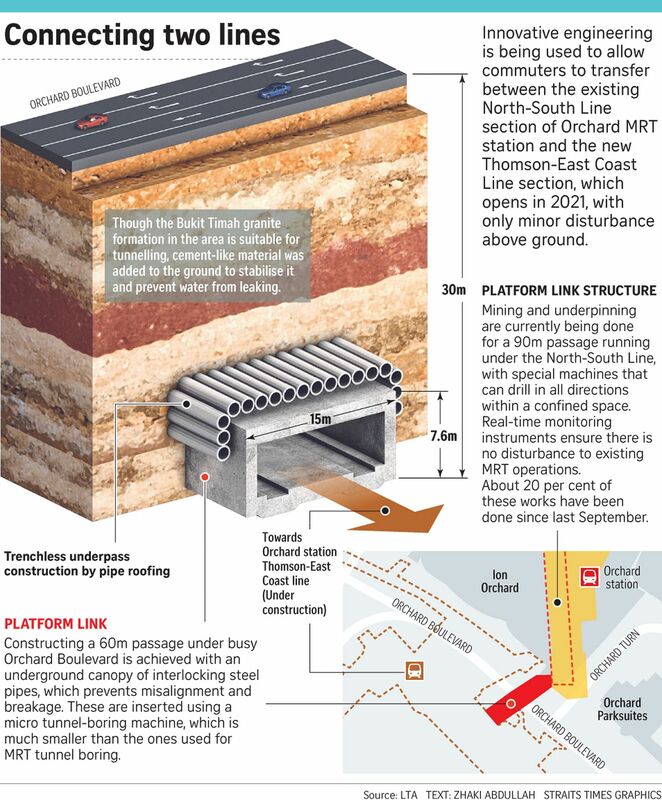 The mining and underpinning being done underneath the existing NSL Orchard station, to connect it to the new TEL platform, is a "major engineering feat", said Mr Foo. This is done using special drilling machines which can drill in all directions within a confined space. The work has to be done incrementally, so as not to disrupt train services. Addition and alteration works will also be done to the existing Orchard station on the NSL to add escalators, a lift and a staircase connecting to the passage linking it to the TEL. The LTA said "detailed planning and close coordination" were being done with transport operator SMRT so as not to disrupt station operations or inconvenience commuters, adding that most of these works can be done only after service hours. "(Thus), these works must be carefully planned, coordinated and executed," it added. A separate pedestrian underpass is also being constructed to connect the TEL section of the new interchange station to the Ion Orchard and Wheelock Place shopping malls. Senior Minister of State for Transport Janil Puthucheary, who visited the worksite on Friday (July 13), said these works showed the innovation and smart engineering being employed in the construction of the TEL. The expansion of Singapore's rail network is not without its problems, he added. "As our network becomes denser and longer, the consideration of what we have to do next changes, because we don't want to interfere with what we have today (existing MRT lines)," he said. When completed, the 43km-long Thomson-East Coast Line will have 31 stations stretching from Woodlands North to Sungei Bedok. It will open in stages from next year, beginning with three stations - Woodlands North, Woodlands and Woodlands South. Correction note: In an earlier version of the story, we said that pipe-roofing is being used for the first time on an MRT project here. LTA has since clarified that it was previously used on the Downtown Line.